Largely unknown to city-dwellers before the 1960s, large apartment complexes (ap’at’ŭ tanji) powerfully shape the landscapes of contemporary South Korean cities. Some are now being memorialized by artists, planners and citizen themselves. How did apparently western-style housing blocks migrate to Korea on such a large scale? To what extent do they reflect the power relations between the global and the local in South Korean cities? What is currently at stake regarding the future of apartments in the contemporary post-industrial Korean society? 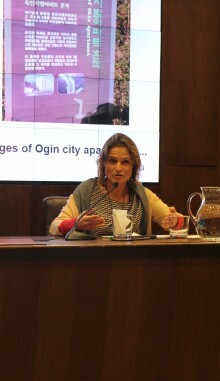 Combining the perspectives of cultural geography and Korean studies, and using ethnographic materials gathered on sites studied since the mid-1990s (in downtown Seoul) or new ones in the making (Songdo), Professor Valérie Gelézeau gave the keynote lecture for the 2015-16 Annual Symposium of the Centre for the Study of Korea on the significance of South Korea as a “Republic of Apartments” (ap’at’ŭ konghwaguk), where apartment complexes have been the main mediation of the Korean society to urban modernity. Professor Gelézeau’s research addresses the various dimensions of space as a social construct in contemporary Korea, via different perspectives including urban geography, cultural geography, regional geography and geopolitics. She is the author of Ap’at’ŭ konghwaguk (The Republic of Apartments, 2007), Atlas de Séoul (2011, a geographical monograph of Seoul as a megacity) and, with Koen De Ceuster and Alain Delissen, the co-editor of De-bordering Korea. Tangible and intangible legacies of the Sunshine Policy (Routledge 2013). After her December 8 public talk, part of the 2015 Annual Symposium “High-Rise Seoul,” Dr. Gelézeau sat down with Asian Institute Graduate Fellow Steven Denney to talk about her interest in Korean apartments, the comparative element her work, and her research experiences. What are the origins of your interest in landscapes and space in Korea? The origins of my interest in landscapes and space can be found in my formative years, in university – I studied geography. That’s where my interests in space and landscapes can be found. I had really great instructors who encouraged me to explore the meaning and significance of space (Augustin Berque at EHESS, Jacques Brun at the École normale supérieure, Paul Claval and Jean-Robert Pitte at the Sorbonne University). I also moved around a lot when I was younger. I didn’t always live in Paris, where I am located now. This influenced my decision to study geography, I’m sure. But my interest in Korea specifically has a slightly different origins story. Personally, my father had a Korean friend at work; he came home for dinner a few times. This represented my first, indirect contact with Korea and got me thinking about the country. To this day, I’m still in touch with his family. Before this contact, I was interested in Asia generally, but no one country specifically. I’m not exactly sure when and how this interest started, but I pursued it with excitement — this is the case for many of us studying Asia; it’s such a dynamic, quickly changing place and subsequently attracts a lot of attention. When I started to look for a topic to study as a master’s student, I was advised to study a new language and had the opportunity to pick a geographical region in Asia; the choices were between China, Korea, and Japan. I picked Korea, in part because research on Korea at that time was underdeveloped in France and I thought there was opportunity to develop the literature on a fascinating country. It’s still underdeveloped, I hasten to add. What lead you to study South Korean apartment complexes? My original research focused on open and public spaces — on the side streets and markets and how modernization processes transformed them; this research informed the very first paper I wrote on Seoul during my master’s studies. For my PhD, having done fieldwork already for my MA, I had a topic in mind: apartment complexes. They are, as those familiar with the country will undoubtedly know, everywhere, and I thought this needed to be interrogated and better understood. European views on apartments at this time — the mid 1990s — was marked by a certain ideologized determinism. You had two opposed ideologized views on housing and apartments which saw the apartment itself as determining the behavior of the individuals living within and the environment that surrounded it. When I started work on my dissertation (1994), apartments were a non-topic. Some people said, “It’s modern; it’s too solve the housing problem.” But if you really look into what some people were writing, there was a lot more being said. During the first round of interviews with planners and architects, I was asked “Why did you pick this topic?” They apparently didn’t think apartments and apartment complexes were a subject worthy of study either! But I thought it was important, so I went ahead with the research. There is a comparative component to your work. What is different about South Korean apartment complexes vis-à-vis French or Western-style housing blocks? In the French academic view of things, there was a kind of deterministic view of apartments, an ideologized view connected to the French experience. Large apartment complexes in France were connected to a mass housing State policy of the 50s and 60s — designed first for the middle class, some were eventually occupied by lower social categories and immigrants. And with marginalized groups moving in and the impoverishment that resulted cultivated an idea that the apartment will create housing and social problems. It’s more complicated than that, of course; maintenance, public policy, and the like are key explanatory factors, but this is the essence of the deterministic view. A similar view has long prevailed in North American with regards to Pruitt-Igoe housing project, the large residential compound in St. Louis that was built in the 1950s and demolished in 1972. In Marseilles, similar buildings — for similar deterministic reasons — have been torn down (some remain). Apartments in France are much less integrated into the fabric of broader society than in Korea. Thus, there arose an essentializing view that apartments themselves create problems. Examples of this kind of determinism abound. The study of primary school performance, based on the floor children live on, is one example. But it’s not the housing itself that is causing this, of course, but socioeconomic standing, cultural capital, etc. There is a causal relationship between the latter variables and performance, not between housing itself and performance. On the Korean side, the discourse focused on scarcity of land, which according to this perspective means high-rise apartment complexes are necessary. This is a very departmental discourse that pairs with the idea that “We must work hard,” “We must work quickly” etc. As any developer will tell you, this isn’t the case. The same housing density can be attained using different morphological types. I wanted to challenge these discourses – the determinism in French literature and the developmentalism in the Korean discourse. Your book, The Republic of Apartments (2007), is a popular hit in South Korea. Can you talk about the production of this book, from inception to translation and after? In 1999, I had a post-doc at Korea University, through the Korea Foundation. Park Sanghoon – before getting actively involved in Humanitas publishing company (he is now the director) – was involved there. We talked a lot about apartments and I gave him a short summary of my completed work on the subject. He wanted to have it translated. Ahyŏn (short for Asea munje yŏn’guwŏn, lit. Asiatic Research Centre, nowadays Asiatic Research Institute at Korea University) — sponsored a first translation, under the title Ap’at’ŭ yeongu (lit. Apartment Research). By the time he moved to Humanitas, he wanted to update and improve on the original translation. So, I updated the whole book, with assistance, and added two chapters, an introduction, and a lot of context about apartments in Korea; it was a lot of work. I spent about a week or so with a translator over every little detail. The translation was so intense that it made me realize that perhaps I should do the research again — that’s how in-depth things got. When discussing the title, Park Sanghoon came up with it. When the book came out, I was based in Philadelphia and had to digitally respond to questions and oblige interview requests. I had to answer to critiques and respond to people – it was very exciting. Since then, the topic of apartments will pique the interests of others and I’ll find myself engaged in dialogue about it. It is a very hot topic, to some extent, and many others have since written on it; it is something that people experience in their everyday lives. What is the intellectual climate like in Western Europe? What are your colleagues at EHESS working on? Are their any geographic (Europe/North America/Asia) or disciplinary divides in how geography is understood? In France, I work with people who qualify themselves as working on cultural geography — a post-modern critical geography, inspired by the work of Henri Lefebvre, and developed by people like Augustin Berque (EHESS), or Paul Claval and Jean-Robert Pitte with the Laboratoire “Espace et culture” that once was located at the Sorbonne and launched the journal Geographie et cultures in the early 1990s. There are connections with American cultural geographers and those doing gender studies, critical border studies, and so on. Regarding the field of Korean Studies more specifically, I feel — but maybe it is linked to my own sensibility — that an approach which focuses on spatial objects (space and landscape) is quite important in France, and that includes pre-modern studies (Koryŏ, and before – which are well-developed in France). Where have you intellectual interests and pursuits taken you since the book was published? After the book was translated, I completely dropped the topic. I moved on to questioning “interfaces” between North and South Korea, and received funding by the national research agency in France to pursue the topic. A team of ten scholars across Europe was assembled. The idea was to study the areas of contact between North and South Korea – spatial contact like borders, but also social contacts, that is, people. This included North Koreans living in South Korea, and contacts between artists, in addition to immaterial contact (ranging from North Korea as it is presented in South Korea and also how North Korea is portrayed in South Korean textbooks or how certain facts are recorded by state news agencies in both). This research effort contributed to the study of interface, a theory, which comes from hard sciences (biology, etc.). We were trying to derive from the topic of “frontière” (borders and frontiers), largely studied by geographers in France and elsewhere, and argue that the political and spatial border between North and South Korea created, in both cases, multiple borders within societies, at every level, and also, that this border is still in the making. Several disciplines of the humanities and the social sciences were represented (archaeology, anthropology, geography, history, political science, sociology, comparative literature) and from this came the book De-Bordering Korea (2013), co-edited by Koen De Ceuster, Alain Delissen, and myself and a 2010 article in the online journal Espacestemps that explains the theoretical background of the project. This article discusses how interface is a place where there is both rupture and contact; it has certain properties. One important quality is that there are points where the contacts are filtered. This can be applied to physical space (place where you can cross) or imaginary space (press agencies filter information — filtering process). Interface has some special geometrical elements, too. Particularly well represented when we study the enclaves around borders. We didn’t actually end up using the concept in the book; it was simply a tool that helped us work together and engage in dialogue between people and interests. Steven Denney is a PhD candidate in the Department of Political Science at the University of Toronto and a doctoral fellow at the Asian Institute. He holds an MA in Global Affairs and Policy from Yonsei University and a BA in Political Science from Harding University. Steven writes regularly for The Diplomat and is also the managing editor for SinoNK.com, a research site for Koreanists and Sinologists working in the digital humanities.